This was kind of a weird month, like for most people, because we had spring break in the middle and all sorts of things go on (like we listed and sold our house!). I finished four books, but am over halfway through a realllly long but good one, so I feel like I've been reading more than this # reflects! I read this one the first week of March, and it was one that I've had on my Kindle for a while (bought it on sale last summer), and hadn't made it around to reading yet. This was also my MMD Reading for Fun Challenge pick for "a book with a reputation for being un-put-downable." I did find this story engaging, as it covers an aspect of American history that is little-known in our current culture—orphan children herded to the younger, western states in late 19th/early 20th century to be given away free to whomever would take them. This story follows an Irish immigrant girl, who loses her family in an apartment fire, from New York City across the country to Minnesota. She goes through three different family placements before ending up with her "forever" adoptive family. Her story is woven in with a foster child, Molly (love the name, duh), in present-day Maine. I found the story very engaging, but the writing not as strong as I would've liked. Maybe I'm getting picky in my old age, ha—I've read so many books in the past year that were SO well-written (and even really recently, like This Is How It Always Is), that it becomes harder and harder to look past other books that don't feel as "tight," no matter how absorbing the story is. Anyway...good book. But won't be on best-of lists for me this year. I'm a member of Modern Mrs Darcy's online book club (which is fun! 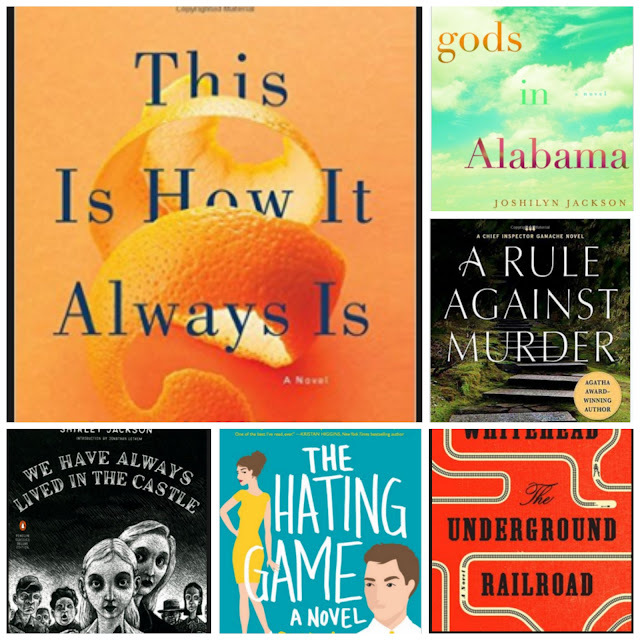 ), and her March pick was Christina Baker Kline (author of Orphan Train! )'s A Piece of the World—I wasn't up for another novel about a painting, but I was intrigued by one of the "flight picks" which was this book, The War That Saved My Life (I'd also heard it mentioned on another book-ish blog). I believe this is considered "middle grade" fiction (which I don't read much of), but has won several awards, and thus fits into the slot of the "Reading for Growth" challenge of Newbury Award winner (yay!). I finished this in three days, and found the story so wonderful—it's about a brother and sister evacuated from London to the British countryside during WWII. If you're thinking Bedknobs and Broomsticks, you're on the right track—though this book is not magical and includes no cartoons, I found it to be a heartwarming and great story all-around. I think I read somewhere there's a sequel coming out, too. This was my first Margaret Atwood book ever to read! It'd been on my library Overdrive "wish list" for a while, but seeing the preview during the Super Bowl *ha) for the new Hulu show moved it to my queue, and when it came up my turn, I left Tara for a minute and read this one while we were at the lake in Arkansas. According to some internet research, I could also count this as "a book with an unreliable narrator" for the MMD Reading for Growth challenge track. Check! Anyway, this book was pretty haunting/mesmerizing, all of those things, and I can't wait for the screen adaptation with Peggy from Mad Men playing the lead. I wouldn't say I "loved" it, but it was definitely an artful post-apocalyptic story, and especially crazy that it was written in the 80s, because all of the themes seem so relevant for today. I read 6 books in February, finishing the 6th one late into the night on February 28 by accident, or it would've been 5. Ha. 1. I started this month with Gods in Alabama by Joshilyn Jackson. I'd heard about this book being great on audio (maybe read by the author? ), but the kindle version had been on sale one day so I snagged it and read it that way. It was a pretty engaging story, but I thought the writing was only fairly decent, and found it to be not very memorable. 2. Finished A Rule Against Murder by Louise Penny, which is #4 in the Inspector Gamache series, again on audio. I just can't quit the audio of this series! I've been going to the gym a lot this year (??) and listening while I'm exercising. I'd heard a lot of people say they thought the series really "picked up" with the fourth book, but I didn't think it was markedly better than the previous two (the first one is the slowest, yet necessary IMO). Anyway, I'm listening to #5 now, and loving that these are so readily available from my library on audiobook. 3. Our book club selection for this month was Underground Railroad by Coleson Whitehead, and I was glad to have a reason to pick it up next, with all the buzz it's gotten in the past year. It was a really, really well-written book that obviously gives you a ton to mull over and I won't try to summarize here or risk doing an injustice. My main note on this one is that I found the characters to be really detached and inaccessible, but also wondered if that was sort of the point? Loved the magical realism component of an actual railroad for the underground railroad piece. 4. The Hating Game by Sally Thorne was recommended by a friend, and it was the perfect light-genre read to throw in at this point! Oh my goodness, I loved this book. I never (like really rarely ever) read anything that could be categorized as "romance," but I thought this book was SO smart and witty and well-done, and inhaled it in about 36 hours and promptly bought myself a copy of it to have because I'd borrowed it from the library originally. Annnnyway, definitely PG13+, but I thought it was smart and really enjoyable. 5. This is How It Always Is by Laurie Frankel—FIVE BIG STARS and I hope to re-read this every year that I have children at home. What a fantastic book. The writing was soooo good, and the story was handled SO well, I was blown away by the artistry as well as the story. THANK YOU, Laurie Frankel, for this treasure of a book. I wrote about this more on instagram because I felt like shouting on the rooftops how much I loved this book. If you pick it up, don't read about it in advance! Just dive in. The story is engrossing enough to do this, and the writing absolutely superb. 6. We Have Always Lived in the Castle by Shirley Jackson—I don't remember reading any Shirley Jackson, although surely I read one of her short stories in school along the way (English degree)? I sort of wish I had a class or group to discuss this one with...a creepy little story definitely worthy of discussion, that kept me up way past my bedtime finishing it up (it's not very long)! Apparently they're making a movie of it this year? None of these were on my list of MMD Reading Challenge picks, but I'm considering doing the Reading for Growth track also, since I'm a little ahead, and if so, will count We Have Always Lived in the Castle as the "book published before you were born." Of other bookish importance, while I have you...Anyone watching Big Little Lies? Enjoyed the book, and not caught up with the series, but I love that format! The gist of the project is that there was a wall where that peninsula jets out, with a regular sized doorway. The patio door to the outside (which was a wooden door that swung in, plus a security door on the outside) was removed, and was formerly where those open shelves are. We got to get a larger sink, move the dishwasher to the left of the sink, and do an under-counter microwave. We also got to add wood floors to match the rest of the house (this was formerly tile that was on a different level that the rest of the hardwoods, by a couple of inches, tres annoying). Meanwhile, where our giant (and pretty, but very dangerous!) single-paned picture window in the former dining room was (below), we made into French doors. We have been absolutely thrilled with the new layout! It is SO much easier to go outside on our back patio, and the stairs outside are the right tread/width (before, the steps were short, tall drop, short, which made it difficult for kids/easy to trip...I'm told there was a deck out there formerly, hence the odd size treads). The counters are quartzite, which I love, and really achieved the look I wanted. We kept our cabinets and just painted them—the "only" new cabinets we had to get made were the ones to the left of the microwave, so basically the peninsula. I got a pull-out trash drawer which is such a dream come true, as well as under-counter lighting. We had several things we couldn't compromise on, but otherwise, I'd say this was a very budget-conscious reno considering all of the layout changes/improvements and aesthetic changes we made (keeping our cabinets, subway tile=cheapest tile ever, etc.). We absolutely LOVE the new flow and the open space, and I am going to miss this kitchen SO FREAKING MUCH when we move to Idaho next year! Yes, that's right...IDAHO! Jonathan got a job at a practice in northern Idaho, and we are moving in July. We are so excited for a new adventure out west! Our kids are still young (5 and under), and Juliette is starting kindergarten in the fall, so it seems like a great time for them to make a transition. We're looking forward to a change of pace from med school & residency, some time to make memories the five of us, on all the myriad adventure options that will be right at our fingertips. We are so, so excited! But yes, I will miss my lovely kitchen and can hope to have the chance to make improvements to wherever we land next! I didn't intend for reading recaps to be monthly (since I did them all quarterly and after-the-fact for 2016), but I plowed through seven (*edited* oops! I can count...) eight books in January, four from my MMD Reading Challenge list, so I thought a dedicated January reading post would be in order. 2) A Fatal Grace by Louise Penny was my first Inspector Gamache audiobook to listen to, and the second in the series. Oh my! We read the first, Still Life, for book club last year, and I liked it, but I'd heard the series just gets better... audio has been the PERFECT format for me to keep going in the series. Ralph Cosham is (acc. to a cursory internet search) award-winning in his readings of the Gamache books—unfortunately, he passed away several years ago, but there are 10 recorded by him. Anyway, I caught this one at the perfect time because I started it the week between Christmas and New Year's, and it takes place during Christmastime in Quebec! So that was perfect. The "crime" itself was pretty weird, but I enjoyed the narration so much I didn't really notice. 3) Better Than Before by Gretchen Rubin—I'd never read in Gretchen Rubin before, but I alternated between reading on Kindle and listening to the audiobook (which the author narrates herself), both via the library. Lots of people have written pithier reviews than this will be, but I absolutely loved the basic premise: Once something becomes a habit you cease spending decision-making energy on it, of which you have a limited reserve. Thus, working toward establishing good habits frees up your decision-making capacity for other things. Pretty simple when you think of it that way, eh? I've recently joined a gym and am making that a daily habit...maybe I'll tackle meal planning next. Ha! But, a really handy book that I wouldn't mind owning my own copy of for reference. She also breaks down people's decision-making habits into four basic tendencies, which, if you're into the personality-sorting type theory, you might find interesting (I'm a classic Obliger, if you've read the book). 4) Next was the hefty Columbine by Dave Cullen, and my first MMD Reading Challenge pick, for the category "a book in a genre you usually avoid"—I'm not sure what genre this is exactly, but I'm such a fiction girl I knew this would qualify. My friend Erin read this a little ahead of me, and I was glad to have someone to text with about it as I was reading. I was a 9th grader when the tragedy occurs, so most of what I remember from this event are hazy memories at best. The basic outline of what I thought happened was what the media was telling us—and, like everyone told me about this book, the book sort of turns all of that up on its head. Dave Cullen was a reporter on the scene of the actual event, but then spent almost the next decade investigating the tragedy from every angle. I am not sure I was quite as swept away by this book as it sounds like some readers are—I definitely had to push through at parts, and admittedly, did not make it through every single word of the hefty appendix. The most fascinating, and IMO most important, part of the whole book was when he dissects the science behind psychopathy (which is, also interestingly, pronounced psy-CHO-pathy, who knew? )...how psychopaths' brains operate totally differently from other humans, on a completely scientific level. Both of those kids came from loving, two-parent homes...it was less outside factors and more base brain science. Scary stuff. 5) I heaved a sigh of relief into going to a delightful fiction read following that—One in a Million Boy, by Monica Wood, which was another MMD Reading Challenge pick: a book you chose for the cover. I bought this on kindle deals back in the summer and hadn't gotten to it yet for some reason. Oh my—I just loved it. I try to be stingy with 5 star ratings, and this one definitely earned it. I thought the story line was inventive and fresh...but I agree with others I've heard that say not to read much about it before picking it up—just dive right in! I loved the characters so, so much, especially Ona. Loved this one! 6) I was #36 on the hold list when I first requested Talking As Fast As I Can by Lauren Graham, my MMD Reading Challenge pick for "a book you don't want to admit you're dying to read" (even though I'm not at all ashamed of my Gilmore love...just didn't really have anything else in this category). So when it came through to my kindle, I'd just finished One in a Million Boy and it was perfect timing. This was a pretty easy read, and I enjoyed it on the whole, mostly because of my deep Gilmore and Parenthood loves—but, I will admit I was hoping for a bit more "juice," if you will. Like I don't feel like I have any deeper of an impression of hers and Alexis Bleidel's relationship than I did before, nor really much other insider knowledge, other than they worked extremely long hours on Gilmore, and not so much on Parenthood. I did love the Carole King anecdote from the new Netflix GG episodes, when they all (apparently) gathered around the piano with Carole King, who gave an impromptu concert during filming. (Can you imagine?!) Oh, another highlight was her explanation of a writing strategy she learned—the "kitchen timer" process, which is basically setting a kitchen timer for 60 minutes, where you minimize all distractions and spend the hour solely writing...if it's not on your writing project, it's at least in your journal, about whatever, and any day that includes a 60-minute chunk of writing time should be considered a win. I liked this a lot! 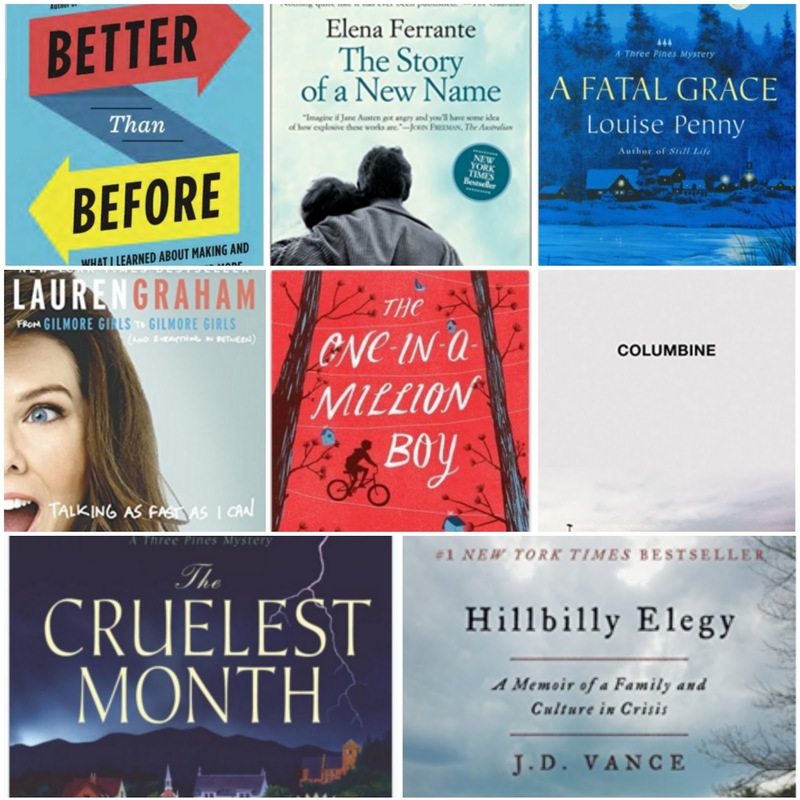 7) Somewhere along the way up there, I had picked up Hillbilly Elegy by JD Vance (my MMD Reading Challenge pick for "a book you were excited to buy but haven't read yet")—this was another kindle deals purchase. A memoir from a guy from white, working-class Appalachia who ended up finishing law school at Yale, I had heard so many good things, seen it mentioned on best-of-2016 lists... but it fell flat for me. Not to sound pretentious (the worst way to introduce a thought!, I know), buuuuuut, since we read Coming Apart for book club at the beginning of 2016, I feel like I'd already done a deep dive into this subject in a way that had a lot more heft and fact behind it than this book. I do recognize that this is a memoir, thus subject to a completely different set of "rules" or expectations than Coming Apart... but it still didn't tell me much I don't feel I've not already read in the Atlantic or whatever, since election time. Annnywayyyy I got through it, but didn't just love it or feel super more informed than before (but yes, the guy's story is definitely inspiring and seems fairly singular for his origin). I finished this one the night of January 31, so it barely squeaked in! 8) The Cruelest Month by Louise Penny, on audiobook. See #2 note, above, on narration. Another weird-ish crime, but I flew through this one listening at the gym (a new thing for January for me, how cliche but good!) and enjoyed it so much, too. Especially as the previous one was set during Christmas, and this one is set in the spring, it was nice, seasonally (not that it's spring here, technically, although it sure does feel like it...). I've heard that Penny really hits her stride with #4, which I have already started and am 3/4 of the way through at press time. To be continued on that front... A small note: it's been really nice to listen to these on audio via the Memphis Library/OneClickDigital app, as they've been readily available without a waiting list, and I was even able to renew A Fatal Grace at least once (which is tough when it's a new release). Also, I've read where people say you don't necessarily need to read these in order, but I've found it helpful. Oh! Another big highlight of this month was recording and being a (small!) 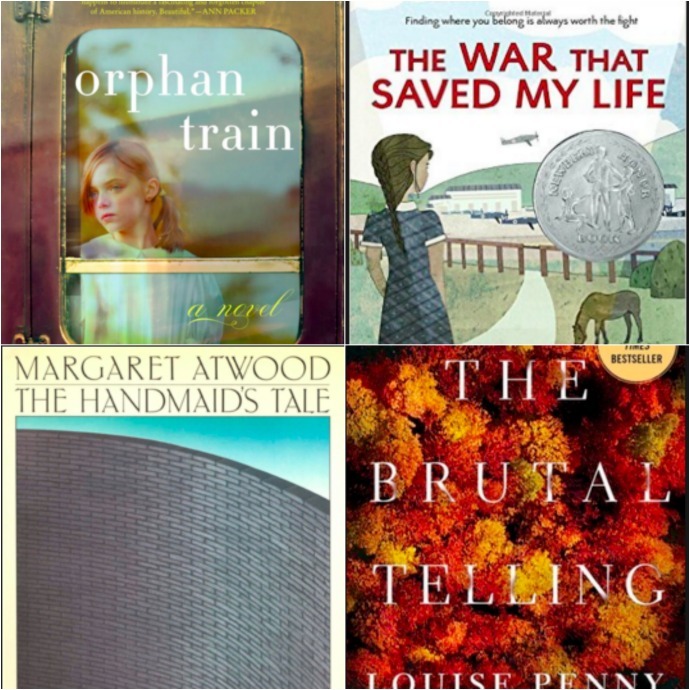 guest on my fave What Should I Read Next podcast, talking about ways we track our reading! Check the episode out here...my part starts a little after the 7-minute mark! Books and podcasts collide—a dream come true. By popular request (ahem one request, ha, Lauren), here's an outline of how we started our book club (in late 2015). 1. First, I read this post from Everyday Reading and got very inspired by the spirit of the thing. I wanted to be part of a hard-core, book-loving (nerdy...but cool?) group of women who met to discuss books. That inspired Leanne and I to brainstorm names, and we came up with "Read It Or Leaf Book Club" or, RLBC for short. 2. Second, the members. 12 was our goal. Leanne is a particular kind of friend to me, in that we are close friends but we do not run in the same social circles (I dunno? ), so this was the perfect exercise. We each invited 3 friends to join, and 2 of the 3 were asked to invite two people themselves, which would equal 12, but a 12 where the most people anyone knew would (theoretically) number 4. Over the months, we have sort of solidified into a strong group of 10 (with some additions and subtractions), but I do want to emphasize how fun and amazing it's been to be part of a group (especially something so fun as a book club) in which I've gotten to meet new people at this stage of life. 3. We use signupgenius.com for our annual calendar. While we were getting organized, one of our members told me that her mom was in a really longstanding book club, and they'd determined the secret to how often to meet was 7 weeks—it neither feels too long or too short. So, I came up with a calendar in advance (via signupgenius), and chose dates in advance (avoiding things like spring break, Easter, and the entire month of December), every 6-7 weeks roughly. This ends up being 9 meetings a year, which is perfect because when we signed up for this school year (oh, and I do a school year calendar), it was 9 meetings for the year—so everyone got to sign up for one of everything. All meetings were solidified as 7:30-9:00 PM on Tuesday nights. 5) Dive in and go for it/get to know each other and read! We wore name tags, unashamedly, for the first couple of meetings and it helped everyone get comfortable! It's interesting to see that be happenstance, we have a lot of educators in our group (not on purpose! and not me, ha). Go forth! Finding a book club will be one of my first assignments for myself when we move to Idaho (yes, that's another post altogether! ).